The greatest challenge of Gus Johnson’s career is over. Just a little over a year into Fox’s grand experiment to transform Johnson into the nation’s voice of soccer, it has come to an abrupt end. As revealed by Richard Deitsch at Sports Illustrated, Johnson is stepping down from his post as Fox’s lead soccer announcer effective immediately. It ends what will go down as one of the biggest rolls of the dice in sports broadcasting that ultimately ended in snake eyes. Johnson told Sports Illustrated on Sunday that he called Fox Sports president Eric Shanks last week and explained that with a full schedule of college football and college basketball, he could not give soccer the attention it deserved and that viewers demanded of a lead broadcaster. Shanks agreed to pull Johnson off the assignment. “I think that it was a mutual decision, but maybe I was the guy who came to it first,” Johnson said. Furthermore, some events in Johnson’s personal life seem to have had an impact on the decision as he just lost his mother earlier this year and is getting married next summer. Johnson and Fox Sports president Eric Shanks made it clear that it’s still possible for Gus to work some games at the 2018 World Cup, but that it would not be in a lead capacity. Shanks said he still wants Johnson to call some soccer matches and both would not eliminate the possibility of calling some 2018 World Cup games. But Johnson will not be Fox’s lead announcer for the 2018 World Cup, nor will he serve that role at the 2015 Women’s World Cup. As a fan of Gus Johnson and his work, this news is disappointing, but not unexpected. Coming into this year, I called it a make or break one for Johnson and Fox soccer. The latter won the day. Johnson had more than his fair share of critics from the outset as he was thrown straight into the deep end by calling a Champions League game in his very first television assignment. And while Johnson showed some glimpses of potential as a soccer announcer (we’ll always have his great call of Wigan’s Cinderella FA Cup victory) there were still many mistakes and growing pains. Contrasting an announcer learning on the job at Fox to the top-notch productions at NBC and the Premier League and ESPN and the World Cup made the gap in quality to the Fox booth that much more pronounced. In the end, the lack of improvements and lack of reps justify choosing not to extend the arrangement any longer. Johnson was also hurt along the way by never having a consistent, experienced analyst to work with in the booth. 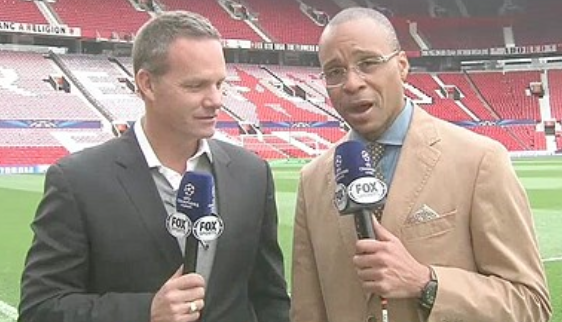 From Ian Wright to Eric Wynalda, it was a revolving door of erratic instability. That fact, combined with his infrequent announcing schedule calling games after the college sports season, made his hoped-for growth almost impossible. It’s a shame this experiment didn’t work as there was great meaning and potential in Johnson taking on this challenge. Being able to have Johnson and his signature energetic commentary as the soundtrack of American soccer could have been massive for the sport’s continued growth. His popularity and personality could have reached an entirely new audience. Fox was very forward with their desire to have an American voice lead their World Cup coverage into a new era as the next step forward for the sport’s growth on television. It would have been terrific for everyone involved if it had come off. And now Fox is back to square one less than a year before their first major worldwide soccer tournament at the 2015 Women’s World Cup. It leaves the network, facing the high bar put forth by NBC and Fox, in an increasingly difficult position. Where will they go? What is Fox’s Plan B? Who are we kidding, we all know Plan B is Joe Buck.